It’s a well known fact that mothers often put themselves, and their health, last. Middle child got an infected toenail? Call the podiatrist. Husband complaining about a funky looking mole? Dispatch the Dermatologist. Preferably via helicopter. When it comes to mama however, it’s often a different story. Because we have #allthethings to do, it often means that that niggle or strange lump gets ignored. Pushed to the bottom of an overflowing To-Do list. This was exactly the case for Deborah Robertson. The mother of two was diagnosed with stage 1 ovarian cancer after feeling ‘off’ for months. After fainting in the shower, Deborah decided to make an appointment with her GP. “I had really heavy periods at the time and was thinking [that] if I could cure the heavy periods, all would be good in the world.” Deborah’s GP sent her for an internal scan to check things out. This was when the tumour on her ovary was discovered, almost by accident. Two doctors came in to look at Deborah’s scan and told her to book in with her GP the next day. It was then she started to suspect something more than heavy periods was the issue. There’s no glossing over the fact that ovarian cancer is still the deadliest cancer for women. 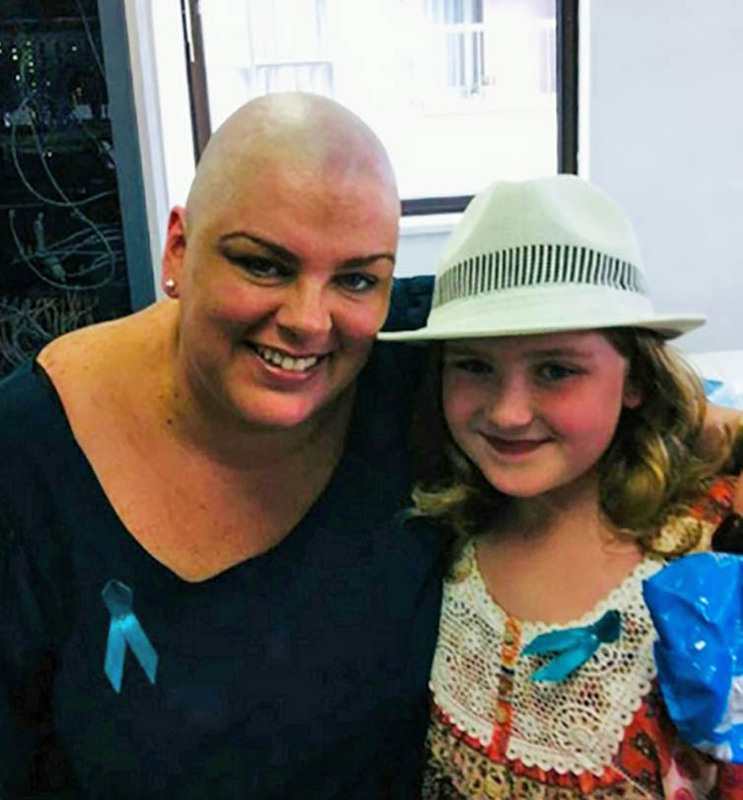 Every day in Australia, four women are diagnosed with ovarian cancer. Three of those women will die from the disease. Yep, you read that correctly. Three of those four women will die. The biggest issue? Lack of awareness, diagnostic tools and a panel of symptoms that are often brushed off as being caused by something benign. 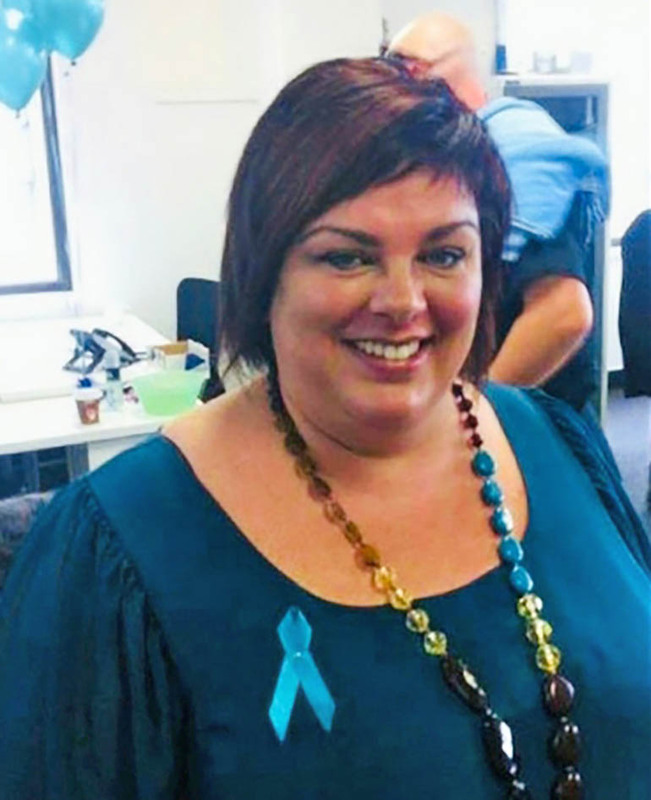 “Ovarian cancer has little or no symptoms in the early stages and can not show up on imaging or blood tests,” says Professor Orla McNally, Director of Oncology and Dysplasia Associate at Melbourne’s Royal Women’s Hospital. She tells Mum Central that, unlike breast and cervical cancer, early detection is a problem. 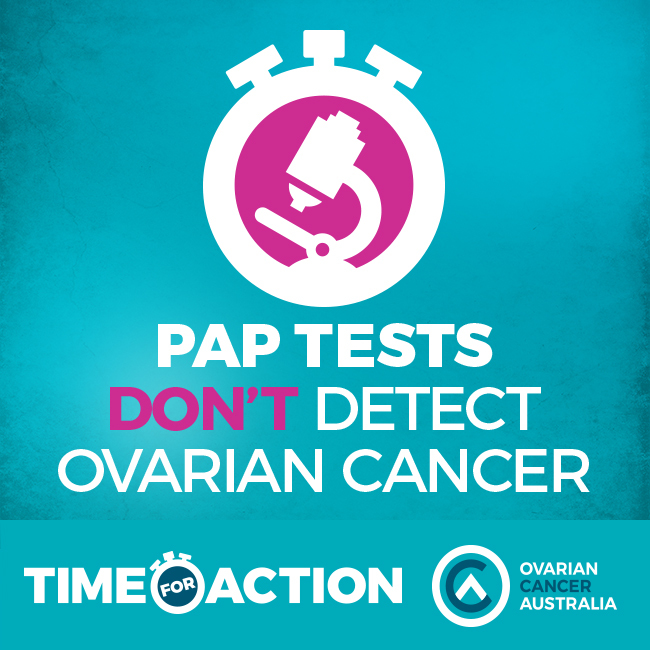 Many women wrongly assume that a pap smear can detect ovarian cancer. It cannot. The only way to detect ovarian cancer is through a trans-vaginal ultrasound or a specialised blood test which looks for a specific protein. This protein, called CA-125, is often high in women with ovarian cancer. The problem with these diagnostic methods however is that the cancer is often in an advanced stage by the time it registers on a scan or in a blood test. 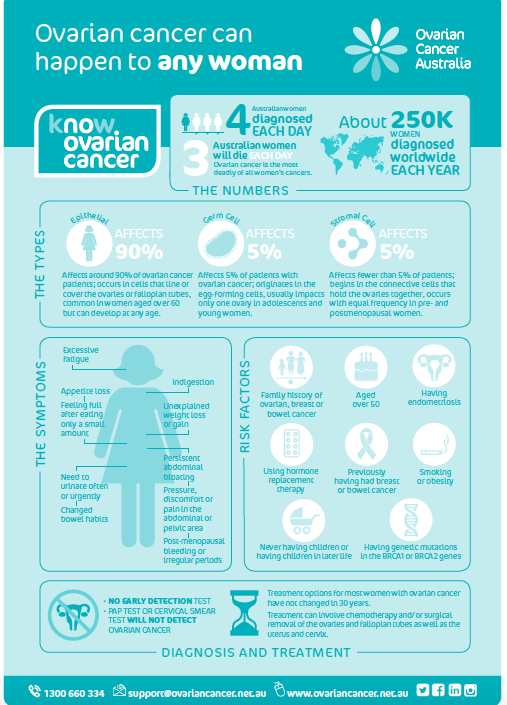 Ovarian cancer is known as the ‘silent killer’ as many of the symptoms only become obvious in the later stages. However, like Deborah, many women who are diagnosed with the disease recognise that ‘something’ isn’t quite right within their body, even before a formal diagnosis is made. There are four key symptoms that can indicate ovarian cancer. It is worth noting that there are plenty of other, non-life threatening, conditions that can cause the same but if you are continually experiencing the following, it’s worth chatting with your doctor. “Women should be aware of any changes in their body and to speak to their GP if they experience symptoms such as bloating, abdominal pain or feeling full after small amounts of food,” says Professor McNally. Women should also be aware of the increased risk factors for ovarian cancer, including genetic links, a family history of ovarian cancer and lifestyle factors including being overweight, smoking, or gynaecological conditions such as endometriosis. The only definitive way to diagnose ovarian cancer is via a biopsy. If your GP is concerned, they may send you to a specialist gynaecologist for further testing. Treatment options will vary, depending on each individual case. 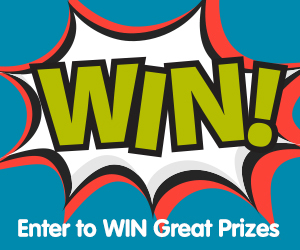 Typically, ovarian cancer is treated through a combination of surgery and chemotherapy. In Deborah’s case, a radical hysterectomy was the best course of action. Her womb, uterus, ovaries and cervix were all removed during the six hour procedure. A sweep was also done to assess whether the cancer had spread (thankfully it had not). There aren’t any specific methods for avoiding ovarian cancer, but for women who are identified as high risk, sometimes quite drastic measures are recommended. A hysterectomy is often the standard course of action. 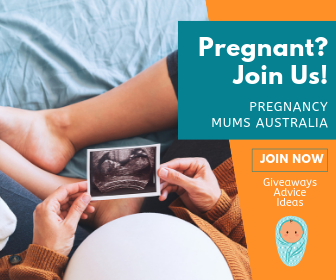 “For women at an identified high risk of ovarian cancer, such as carrying the BRCA 1 or 2 genetic mutation, we recommend having surgery to remove their ovaries and fallopian tubes after they have finished their family,” explains Professor McNally.